Later summer view from Attitash. Description: Most of the time when you visit White�s Ledge you won�t see a single other climber. Although it�s not exactly back-country-climbing, it does take some effort to get there. There are a number of moderate routes on the cliff that are well worth doing and the rock is generally good. However there is often loose rocks on ledges and use of a helmet is highly recommended. 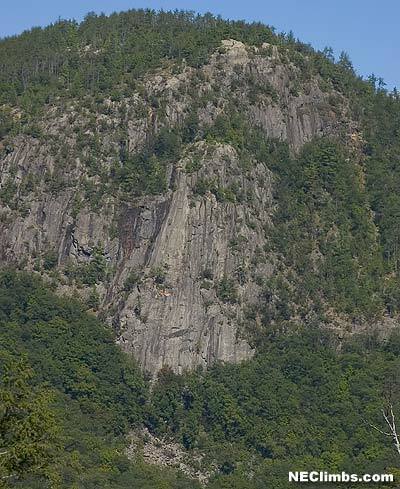 NOTE: A significant rockfall occurred in the spring of 2004. A section of the ledge to the right of the second pitch of Endeavor fell down. Endeavor was spared, but there may still be loose rock to the right for some time to come. Directions: Drive north on Rt. 302 from the intersection of Rt. 16, to Covered Bridge Lane, just before the red covered bridge gift shop. Stay left at all intersections until you see a dirt road on the left and a pipe gate. The gate should always be open. This road runs parallel to the Saco River on your left. Follow the dirt road past a swamp on your right looking for 2 pullouts on your right. Park here and follow an old logging road towards the ledge, and slightly left. Bear right at the Y and look for a bunch of cut logs and a small cairn. Head generally uphill, following a trail with a drainage on your right to the talus field below the start of the routes. Where the trail exits the talus at the top, Endeavor will be slightly uphill on your left.